Hypothesis Breast cancer in pregnancy will increase as more women postpone childbearing until later in life. Objective To review the literature on diagnosis, staging, treatment, and prognosis. Design and Methods Articles were obtained from MEDLINE (1966-present) using the keywords breast, cancer, carcinoma, and pregnancy. Additional articles were sought using the references of those obtained. A total of 171 articles were found, 125 in English. More than 100 were reviewed, including 7 prospective and 40 retrospective studies, 6 case reports, and at least 47 review articles on various aspects of pregnancy and cancer. Data extraction was performed by 1 reviewer. Results Diagnostic delays are shorter than in the past but remain common. Mammography has a high false-negative rate during pregnancy. Biopsy or needle aspiration are needed for diagnosis and cannot be postponed until after delivery. Pregnancy-associated cancers tend to occur at a later stage and be estrogen receptor–negative. However, they carry a similar prognosis to other breast cancers when matched for stage and age. Although modified radical mastectomy is the traditional treatment, breast-conserving therapy is increasingly common. Therapeutic radiation is contraindicated, but chemotherapy is relatively safe after the first trimester. Tamoxifen should be avoided in the first trimester and possibly beyond. Conclusions Physicians should perform a thorough breast examination at the first prenatal visit and maintain a high index of suspicion for cancer. Patients who wish to continue their pregnancies have a growing array of treatment options. BREAST CANCER in pregnancy is expected to be increasingly common as women delay childbearing until later in life, when the incidence of breast cancer tends to rise. The frequency ranges from 1 in 3000 to 1 in 10 000 deliveries, making breast cancer the second most common malignancy in pregnancy after cervical cancer.1 Put another way, at least 10% of patients with breast cancer who are younger than 40 years will be pregnant at diagnosis.2,3 This article reviews the literature on diagnosis, staging, treatment, and prognosis. Most researchers define pregnancy-associated breast cancer as one that is diagnosed during pregnancy or up to 1 year post partum.4 However, there is considerable variation among authors, with postpartum periods ranging from 6 months to 2 years. The differential diagnosis of a breast mass in a pregnant woman includes not only cancer but also lactating adenoma, fibroadenoma, cystic disease, lobular hyperplasia, galactocele, abscess, lipoma, and hamartoma and rarely leukemia, lymphoma, sarcoma, neuroma, and tuberculosis.9 Although 80% of breast masses are benign, any mass persisting for 2 to 4 weeks deserves further workup. Recent research indicates that women with a genetic predisposition to breast cancer may be overrepresented among pregnant patients with cancer. In a multicenter case-control study in Japan (n = 383),13 a family history of breast cancer was 3 times more common in pregnant and lactating women with breast cancer than in other patients with this disease (12.4% vs 4.2% of controls). Another small study found BRCA2 (the breast cancer susceptibility gene) mutations in 8 of 9 archival samples from women with pregnancy-associated breast cancer vs 3 of 15 samples from unmatched nonpregnant controls.40 Finally, in a Swedish study of 292 women diagnosed as having breast cancer before age 40 years, known BRCA1 and BRCA2 carriers were more likely to develop cancer during pregnancy.41 Among BRCA mutation carriers, high levels of circulating estrogens during pregnancy may accelerate a malignant transformation that has already begun. Historically, inflammatory carcinomas were thought to be more common in pregnancy.7 However, most studies reported since the 1960s have found a similar incidence of inflammatory breast cancers in pregnant and nonpregnant patients, ranging from 1.5% to 4.2%.9,42,43 Numerous studies have found that women with breast cancer in pregnancy have larger tumors and are more likely to have positive nodes, metastases, and vascular invasion.4,10,13,16,18,44 In a retrospective case-control study, Zemlickis et al45 found that women with breast cancer in pregnancy were 2.5 times more likely to have distant metastatic disease, probably because of a later stage at diagnosis. From 56% to 83% of pregnant women have positive nodes at diagnosis vs 38% to 54% in the nonpregnant population.2,11,13,15,16,42-44 It is unclear if these differences are entirely due to delayed detection or if the increased vascularity of the breast during pregnancy, high circulating levels of hormones, and immune-suppressed state of pregnancy accelerate the course of cancer. Notably, in a study by Anderson et al46 of women whose breast cancer was diagnosed before age 30 years, there was no overall difference in the incidence of positive nodes among pregnant (n = 22) and nonpregnant (n = 205) women. That study excluded women who initially had locally inoperable or metastatic disease. Many studies have also shown decreased estrogen receptor (ER)–positive status in pregnant patients with breast cancer, possibly owing to receptor down-regulation in pregnancy (Table 2).2,13,15,18,39,43,47-53 Merkel3 hypothesized that high levels of circulating estrogens may even prevent ER-positive cancers. Although younger, nonpregnant women tend to have more ER-negative cancers, that does not fully explain the extent of this trend among pregnant women. The largest study of hormone receptor status, by Bonnier et al,15 involved 75 patients with breast cancer in pregnancy and a control group of 182 nonpregnant patients with breast cancer. In the pregnant group, 42% of cancers were ER-negative and progesterone receptor (PR)–negative vs 21% in the age-matched controls. Ishida et al13 reported 70% ER-negative and 71% PR-negative tumors in a group of pregnant and lactating women vs 39% and 32%, respectively, in age-matched controls. Surgery is the definitive treatment for pregnancy-associated breast cancer. Risks of surgery during pregnancy include spontaneous abortion and preterm labor. About 0.5% to 2.0% of all pregnant women undergo operations ranging from biopsies to major procedures. Duncan et al57 compared 2565 pregnant women who underwent surgery with controls and found more instances of spontaneous abortion (relative risk [RR], 1.58-2.0) in the surgical group, particularly with general anesthesia and gynecological procedures. There was no increased risk of congenital anomalies. 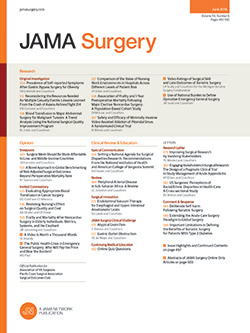 Mazze and Kallen58 examined 5405 cases of nonobstetric surgery during pregnancy and noted increases in neonatal infant mortality rates (RR, 2.1) and low and very low birth weights (RR, 2.0-2.2), which they linked to a greater incidence of prematurity and intrauterine growth restriction. It was unclear if these problems were associated with the underlying maternal cancer that led to surgery. There was no increase in congenital anomalies or stillbirths and no association between type of anesthesia and outcome. Spontaneous abortions were not addressed. Breast surgery during pregnancy appears to be reasonably safe. In a 1962 series of 134 patients undergoing breast biopsy with general anesthesia, Byrd et al9 reported only 1 miscarriage. Berry et al43 performed 14 modified radical mastectomies during pregnancy, including 4 in the first trimester, without any fetal compromise or preterm labor. Collins et al59 performed 12 breast biopsies during pregnancy, all in the second or third trimesters, with only 1 complication. Most patients received local anesthesia. Of the 3 general anesthesia recipients, 1 also underwent a modified radical mastectomy at 28 weeks' gestation. She experienced preterm labor successfully treated with magnesium sulfate and terbutaline sulfate and was delivered of a healthy child by cesarean birth at 32 weeks. Mastectomy and axillary dissection are traditionally considered the best choice for stage I or II and some stage III tumors when the patient wants to continue the pregnancy.4 Mastectomy eliminates the need for postoperative irradiation in early-stage breast cancer, with its ensuing risks to the fetus. Axillary dissection is preferred because nodal metastases are commonly found in pregnancy-associated breast cancers, nodal status affects the choice of adjuvant chemotherapy, and sentinel node biopsy in pregnant women poses an unknown risk to the fetus from the radioisotope. Nicklas and Baker20 suggest that sentinel node biopsy may be safe with a minimal dose of 500 to 600 µCi using double-filtered technetium Tc 99m sulfur colloid. However, no supporting studies for this approach are available at this time. For patients diagnosed in the late second trimester or beyond, lumpectomy and axillary dissection followed by irradiation after delivery represent a viable treatment option.26,60 If the woman is far from term, breast-conserving surgery can be followed by chemotherapy after the first trimester and irradiation after delivery.26 Depending on the treatment timetable, the patient may undergo cesarean delivery as soon as the fetal lungs mature. Kuerer et al60 reported no difference in disease-free or overall survival rates with breast-conserving surgery for stage I and II tumors when compared with modified radical mastectomy (N = 26). Of course, treatment varies based on the individual's tolerance for risk to herself and her fetus and the aggressiveness of her tumor. Radiation therapy generally is not offered because it poses 2 kinds of risks: teratogenicity, and induction of childhood malignancies and hematological disorders. Fetal stage of development as well as dose, intensity, and distribution of radiation are directly related to the toxicity of irradiation during pregnancy. Fetal death is most likely to occur before implantation (days 0-9 after conception), whereas radiation-induced malformations occur between days 15 and 50, during organogenesis. Irradiation-induced growth restriction and mental retardation occur during the first trimester, as does the induction of childhood cancer. For node-positive patients or node-negative patients with a tumor greater than 1 cm, a 4- to 6-month course of chemotherapy is the standard of care. All chemotherapy agents used in the treatment of breast cancer are pregnancy category D, meaning that teratogenic effects have occurred in humans. However, the greatest teratogenic risk occurs in the first trimester; outside that window, most reports show a surprisingly safe profile (Table 3).43,66-73 Through 1985, the National Cancer Institute's national registry contained 210 reports of chemotherapy use during pregnancy and 52 associated birth defects. Notably, all but 2 defects were associated with first-trimester chemotherapy.74 Similarly, Doll et al75 reported a 16% risk of malformations with first-trimester chemotherapy vs a 1.3% risk later in pregnancy. In the past, alkylating agents such as cyclophosphamide were associated with frequent malformations. One literature review found a 13% risk of birth defects with the use of alkylating agents in the first trimester and a 4% risk later in pregnancy.76 However, such reviews are subject to reporting bias in favor of malformations. In addition, the cases reviewed often involve multiple agents and irradiation, making it difficult to distinguish the effects of any 1 drug. Long-term effects of chemotherapy on offspring are unknown. Gwyn and Theriault26 examined the limited data extending across 2 decades and cautiously concluded that antenatal chemotherapy does not appear to affect a child's growth and development. Chemotherapy dosage during pregnancy is complicated by increased plasma volume, increased hepatorenal function, decreased albumin concentration, and decreased gastric motility as well as the theoretical possibility that the amniotic sac might act as a third space. In addition, almost all chemotherapy agents cross the placenta. Because the newborn's liver and kidneys cannot metabolize or excrete chemotherapeutic drugs quickly, it may be wise to avoid or reduce chemotherapy for 1 month before delivery.43,74,80 Doxorubicin has been measured in the tissues of a stillborn infant whose mother received the drug shortly before delivery.81 Similarly, 5 of 15 women receiving leukemia chemotherapy within a month of delivery had newborns who were pancytopenic.80 In a French survey of women who, on average, had breast cancer chemotherapy 25.2 days before delivery, 1 of 17 had a newborn with leukopenia.53 Cyclophosphamide, methotrexate, and doxorubicin can enter breast milk, and breastfeeding is contraindicated during chemotherapy. Oophorectomy is not recommended in conjunction with pregnancy-associated breast cancer, in part because patients are likely to have ER-negative tumors that are not affected by endogenous hormones. In a 1963 study of 41 pregnant patients with breast cancer who had an oophorectomy, none improved.10 Ishida et al13 noted a decreased 5-year survival rate after oophorectomy of 42%, vs 77% in pregnant women who kept their ovaries. Similarly, abortion is no longer routinely recommended; no improvement in survival rate can be found in the available data.6,9,42,83 One study even associates abortion with a decreased survival rate.42 It is unclear if this is a true trend or a result of the tendency for abortions to be performed in women with worse prognoses who want first-trimester chemotherapy or irradiation. A growing body of evidence indicates that the risk of breast cancer peaks for 3 to 15 years post partum in all women, followed by a decrease in the long-term.15,44,86,87 Most of this research was done in women without a history of breast cancer. Patients recovering from pregnancy-associated cancer often seek advice on when and if to have another child. Unfortunately, most relevant studies are small and retrospective and rely on physician recall to find women who become pregnant after cancer treatment.88,89 According to the limited evidence, future pregnancies seem safe for the mother unless she has an ER-positive cancer that has not been cured.83,89-91 Velentgas et al92 found no statistically significant decrease in overall or disease-free survival rates for survivors of breast cancer who become pregnant. More than half became pregnant within 2 years of their diagnosis (N = 53). Several studies of women who had a history of breast cancer and subsequently became pregnant have shown a "healthy mother effect": the former cancer patients who became pregnant had a better 10-year survival rate than their matched controls.91,93 Cooper and Butterfield94 also found that breast cancer survivors who subsequently became pregnant had a better 5-year survival rate than controls matched for age and stage. Investigators speculate that only cancer survivors who were initially healthy would continue a pregnancy. However, further research is needed, and a prospective multicenter trial is under way in the United States.95 Velentgas and colleagues noted an increased risk of miscarriage after breast cancer treatment (24% vs 18% in controls) and speculated that this could stem either from hormonal changes related to therapy or from an underlying higher risk of miscarriage. The standard advice to avoid pregnancy for 2 years after breast cancer treatment6,10,85 is somewhat arbitrary given that follow-up must extend for decades. Some oncologists recommend that women with stage III cancer wait 5 years and that women with stage IV disease not consider childbearing.88 The decision on when it is safe to get pregnant again must depend on a realistic assessment of the worst-case scenario if the mother should relapse during pregnancy or while her children are young. Breast cancer in pregnancy will increase as more women postpone childbearing until middle age. Delays in diagnosis are common. Obstetricians should perform a thorough breast examination at the first prenatal visit and maintain a high index of suspicion for cancer. Mammography poses a low risk for radiation exposure to the fetus in the second and third trimesters. However, mammography has a high false-negative rate and is of limited value because of pregnancy-induced changes of the breast. Ultrasonography is a valuable adjunct to the clinical examination, but fine-needle aspiration or core needle biopsy is needed for diagnosis and cannot be postponed until after delivery. Although pregnancy-associated cancers tend to occur at a later stage and are more often ER-negative, they carry a similar prognosis to other breast cancers when matched for stage and age, particularly if they are detected while still node-negative. Mastectomy and axillary dissection is the traditional treatment of choice. Alternatively, if the cancer is diagnosed later in pregnancy, lumpectomy may be done followed by irradiation after delivery. Therapeutic radiation during pregnancy cannot be recommended because of the risk to the fetus. Chemotherapy is relatively safe after the first trimester and is best given after the middle of the second trimester. Its long-term effects are still unknown. Hormonal therapy should not be used in the first trimester; the risks later in pregnancy and in the long-term remain unclear. According to limited evidence, future pregnancies do not appear to change survival rates. Corresponding author: Thelma C. Hurd, MD, Division of Breast Surgery, Roswell Park Cancer Institute, Elm and Carlton Streets, Buffalo, NY 14263 (e-mail: thelma.hurd@roswellpark.org). Accepted for publication September 15, 2002.